Framed Poster Pier in the morning. Orlowo, Poland. Framed Poster Wooden footbridge on a foggy sand beach background. Portugal. Framed Poster Wooded bridge in the port between sunrise. Poster Wooden pier on lake in a cloudy and foggy mood. 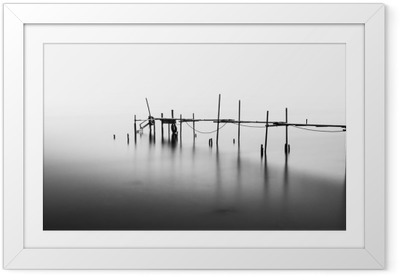 Framed Poster Fine art image of wooden fishing jetty at beach in black and white.Long exposure shot with motion blur. Self-Adhesive Poster Looking over a pier and a boat, dark tone.